The Chicago Blackhawks would be happy to never see Semyon Varlamov again. 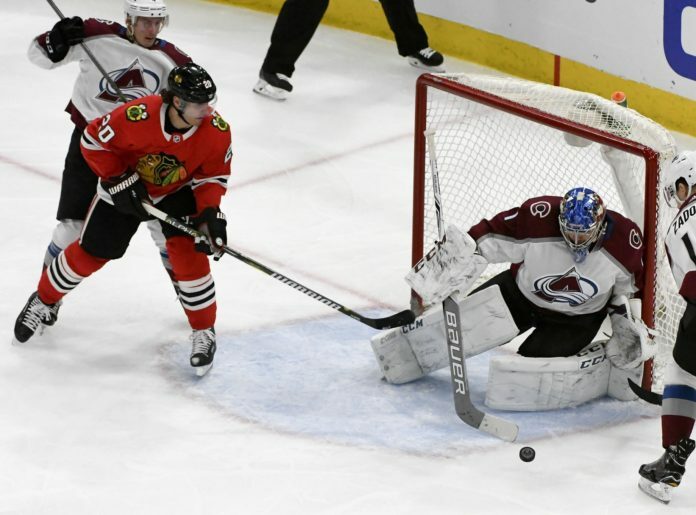 Varlamov, who entered the night sporting a .930 career save percentage against Chicago in 20 games, stopped 44 of 45 shots Tuesday night — many of the spectacular variety — on his way to shutting down the Blackhawks and leading the Avalanche to a 5-1 victory. 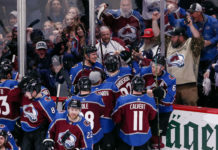 With the win the Avs gave themselves some breathing room in the playoff picture, finding themselves four points ahead of the ninth-place Dallas Stars at the end of the night. The Blackhawks came out firing and brought a big, physical presence early. Just a minute into the game, former Avalanche forward Andreas Martinsen laid a huge hit into Nikita Zadorov on the forecheck. The hit would knock Zadorov out for the rest of the first period, but he would manage to return in the second, much to the delight of Avs fans. Chicago would carry a lot of the play early in the game with consistent offensive zone pressure, but Varlamov continued to stand tall. A penalty by Erik Johnson late in the first gave the Blackhawks a power play, and Brent Seabrook fired a shot through traffic and past Varlamov to give the Hawks the one-goal lead. The Avs would push hard to finish the period, but were unable to tie it up. The second period would be a very different story. An early penalty by Martinsen put the Avs on a power play, and Alexander Kerfoot, who had not scored in 14 games, buried his own rebound to tie the game up. Just three minutes later, the Barrie-MacKinnon-Rantanen line would go to work. The trio entered the Hawks zone on an odd-man rush and Nathan MacKinnon showed off his newfound confidence and patience, baiting the Blackhawks to focus only on him, only to find Mikko Rantanen backdoor to give the Avs the lead. Seven minutes later, the trio would do work again, this time on the powerplay. 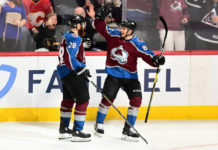 Tyson Barrie would launch a one-timer off a pass fom Rantanen that Anton Forsberg would not be able to handle, giving the Avs a two-goal lead heading into the third. In the third period, it was the Semyon Varlamov show. The Blackhawks found themselves on the power play twice in the first ten minutes of the period, but Varlamov would continue to stand tall. In total, he stopped 19 shots in the third period alone and looked to be in the heads of the Blackhawks and their stars. 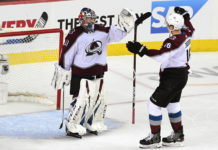 His best series of saves came in the final five minutes where a goalmouth scramble left Varlamov sprawling on the ice to stop a rebound while getting a little help from Captain Gabriel Landeskog behind him. Erik Johnson would add an empty net goal, and Kerfoot would score his second goal of the game in garbage time to give the Avs the 5-1 victory. The Avs now head home with a strong grasp of a playoff spot for a quick two-game homestand. On Thursday they faceoff against the Los Angeles Kings, one of the teams they’re fighting in the standings for playoff contention. The game starts at 7 PM MST. Colin Wilson returned from an extended absence due to a concussion. He picked up an assist on Kerfoot’s first goal with some good work in front of the net. Carl Soderberg missed the game due to illness, forcing the Avs to dress three rookie centers behind MacKinnon. It played a role in the Avs giving up 45 shots. J.T. Compher may have had his best overall game in months, finishing with the Avs best possession numbers (68 percent) and making some tremendous defensive plays late in the game. Zadorov, despite missing an entire period, still managed to finish fourth on the defense in ice time. That shows you how valuable he is to this team and how much they need him. It appears Jonathan Bernier is nearing a return, which would be huge for the Avs. Varlamov has played a lot of hockey over the last month and could use a break.